Global FC looked frightening. They had quality in every position and more on the bench ready to be called in. Although the Guirado brothers have moved on, the club has acquired the services of Jeffrey Christiaens and Matthew Uy, both of whom starred in the national team’s victory in the Philippine Football Peace Cup just three days earlier. Global was patient and classy, capable of getting behind the ball in numbers or play fluent passing moves in the opponents’ half. 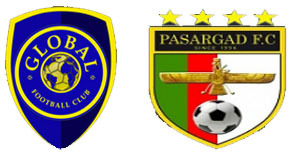 Global might have won over Pasargad, 3-1; but the best goal of the game – and the night as well, since there were two fixtures scheduled – belonged to Pasargad. Masood Shadideh’s technique for the overhead kick was excellent training video stuff. The ball was the perfect height, crisp and left Global’s goalkeeper Sadia Roland with absolutely no chance. That goal would not have been out of place in a World Cup. The referee for the first match between Global and Pasargad played the advantage rule remarkably well. He was prepared to let play continue after a foul and called it back when no apparent advantage developed from it. I really appreciated that. Any football player will tell you that there are few things more infuriating than to come away from a foul with an obvious attack developing only to be called back by the referee. If the game was perdegana, then Nate Burkey would have come away with a hattrick. The wonder of it all was that he scored Kaya’s only goal after United’s goalkeeper Patrick Deyto went for an innocuous cross that should have been routine for the defender – and spilled it. Is there any position that Carli de Murga cannot play? He started at centre-back for Global – the same position where he played all three matches in the Peace Cup for the national team – but later moved up to midfield, which I feel is his most natural position. He is technically gifted and has this natural ability to link together short passes with teammates. He is not bad playing fullback or centre-back; but his lack of pace means that he will always be a liability against fast-raiding opposing forwards. Green Archers United came to its match against Kaya FC resplendent in blue. Seriously? Seriously! It was probably one of the terms dictated by Globe Telecom, the club’s corporate sponsor. Still, anybody who sits on either side of the Green and Blue Divide could not have failed to see that as worth at least a smirk if not an outright guffaw. The referee for the match between Kaya FC and Green Archers United was fair. He failed to give an obvious penalty to either side. If that is not being fair, I do not know what it is. I just prefer to be positive. After all, one never knows with the new anti-cyber-crime law. There was also what looked like an indirect freekick awarded to United inside Kaya’s penalty box that totally mystified me. This is not unheard of; but I have seen penalties given for less than the foul that was committed leading to the indirect kick. Fortuitously, it was from the indirect kick that United scored to level the match. If the game was perde gana, then Nate Burkey would have come away with a hattrick. The wonder of it all was that he scored Kaya’s only goal after United’s goalkeeper Patrick Deyto went for an innocuous cross that should have been routine for the defender – and spilled it. In authentic modern day goalkeeping fashion, Deyto had a go at the defender for what I thought was his own mistake. Other than this early anomaly, he had an excellent match and made several crucial saves. The heavens opened up during the second match and so it was played under pouring rain. Remarkably, the pitch did not – repeat, did NOT – cut up. I had played at the Rizal Memorial in the late seventies and early eighties when the pitch was either a sea of mud or a gravel-littered rough road to Timbuktu. Life is so unfair, but I still thank the Lord that the Grand Dame that is the Rizal Memorial finally has a pitch that its history so richly deserves. I hope it is maintained because there are few things uglier on television than a football pitch that resembles a motocross track. The UFL is on primetime! Yes, on the same time slot as the PBA and the NCAA! Two years ago, I never would have thought it possible to be watching local club football within the comforts of my living room. There is, indeed, a God! Photos captured from the official UFL site at: http://www.uflphilippines.com.ph/cup/home.html.